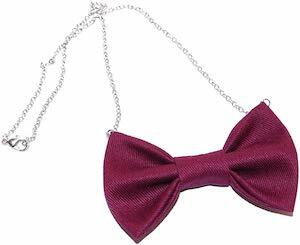 Now you can wear a bow tie just like Doctor Who because this is a bow tie necklace. The necklace has a 16 inch long chain with a 2 inch extender and on the necklace you can find a nice bow tie just like one that the 11th Doctor would wear. 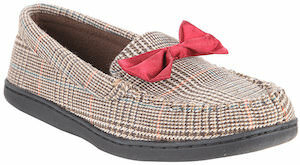 We show you the Burgundy colored bow tie but you can choose from many other colors. The bow tie is 3 x 1.75 inches and will just be fun to wear any day of the year or as part of your cosplay costume. So this unique Doctor Who jeweller is great for you or as a present for a true fan of the Doctor. If you have hair that can use a hairband then you should be checking out this Tardis headband especially if you are a Doctor Who fan. The Doctor Who headband is black and on the black you can find purple flowers and images of the Tardis and that the light purple and the blue of the Tardis really look nice on the black headband. 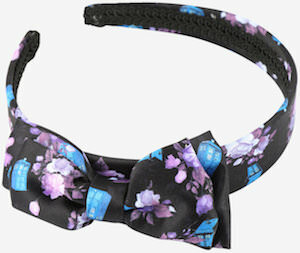 And this is not just a flat headband, this headband has a bow on it in the same print as the band and that almost makes it looks like you are wearing a bowtie on your head. Now you can wake up in the morning and just get your Tardis headband and your hair is out of the way and that makes you ready for another amazing day. If the 11th Doctor is your favorite then this necklace could be just what you need. This necklace has an 18 inch metal chain with a 3 inch extender and on the necklace you can find two items only the 11th Doctor can wear so amazingly as he did. The red fez and purple bow tie. You can find the bow tie dangling under the fez just like how it would look when Doctor Who would wear it. Now you can have special jewelry that only a true Doctor Who fan would understand and the rest of the world would just think looks fun. 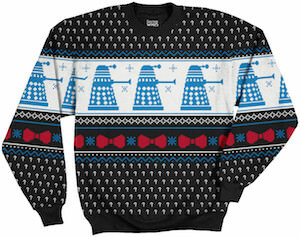 If red and green are to much for you for the holidays then you may like this black Christmas sweater with Dalek and bowties on them. This Doctor Who Christmas sweater is mainly black with white question marks and then there is a white panel that shows blue Daleks on them and below that a row of red bowties. So now you found the perfect ugly Christmas sweater you can wear and even after Christmas sweater can enjoy while watching reruns of Doctor Who of course with the 11th Doctor because of the bowties. You can get this Doctor Who Christmas sweater in men’s sizes Small – 2XL and yes ladies it will fit you perfectly to. One thing everyone remembers from the 11th Doctor is his bow tie but we also still think back of the time he wore a fez. 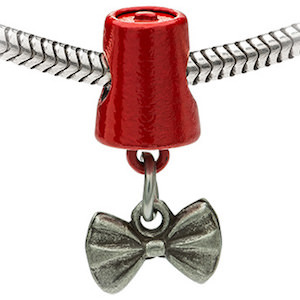 If you have a charm bracelet with space for a reminder of the 11th Doctor Who then this charm would be perfect. 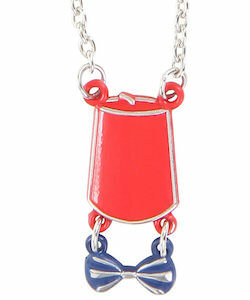 The dangle charm looks like a red fez with dangling below it a bow tie. And this bracelet bead will fit all mayor brands of charm bracelets like PANDORA, Chamilia, Biagi and Troll. This Doctor Who bracelet charm is made from 316L surgical stainless steel so you know it’s good. Yes kids like Doctor Who to and for those little Whovian’s there now is this special t-shirt. The shirt shows a red bow tie and below it the text “Bow ties are cool.”. And this unisex t-shirt comes in many fun colors so that boys and girls can enjoy it. And this Doctor Who kids t-shirt is available in many youth sizes so that many kids can enjoy a t-shirt that reminds them of the 11th Doctor. 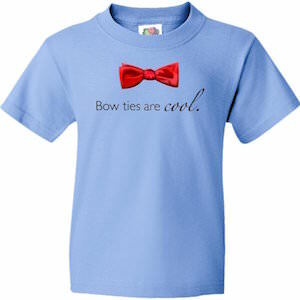 Surprise your child with this Doctor Who Kids Bow Ties Are Cool T-Shirt. As a Doctor Who fan you of course know that the 11th Doctor was a bit of a pirate and this t-shirt shows it. 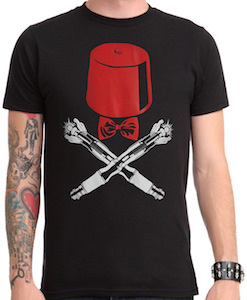 On this black t-shirt you can see from top to bottom a fez, bow tie and two Sonic Screwdriver in a way like you see the bones on a skull and bones pirate flag. And that all makes this the perfect Doctor Who t-shirt for talk like a pirate day or any other day of the year. The Doctor Who pirate t-shirt comes in men’s sizes XSmall – 3XL and yes girls can wear it to. And this Doctor Who t-shirt is made from 100% cotton. If you know all about the 11th Doctor then you know that bow ties are cool. And this Doctor Who t-shirt gives that message one more time. 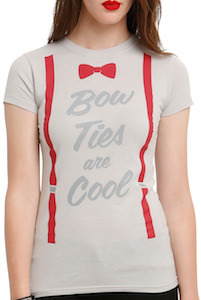 On this fitted grey t-shirt you can see red suspenders and a red bow tie and below the bow tie it says “Bow Ties are Cool”. You can get this fun Doctor Who t-shirt in unisex size and it is made from 100% cotton to give you the perfect fit and feel. A watch is a great way to show the world you style. And if Doctor Who is part of you style then you have to take a look at this Doctor Who watch. 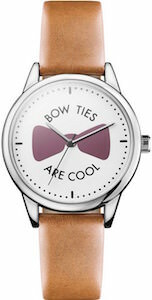 This alloy watch has a nice brown leather strap that fits perfectly with the watch face that has a burgundy red bow tie and around it the text “Bow Ties Are Cool” and we all know what Doctor said that. This wrist watch is gone make you check the time like a million times a day because this Doctor Who watch is as cool as the 11th Doctor thinks bow ties are.